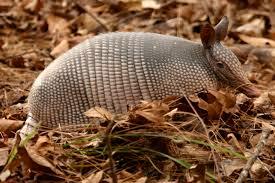 This armoured mammal is 35-60cm long and belongs to the most frequent armadillos. The armour has 8-10 flexible cross bands in the middle of its body, the long tail (25-45cm) is also partly armoured. They have big ears and a long pointed nose. Nine-banded armadillos are living in cool dens, built on shores or slopes. To get their food, they root up the ground to track down termites, ants, snails, worms and insects.